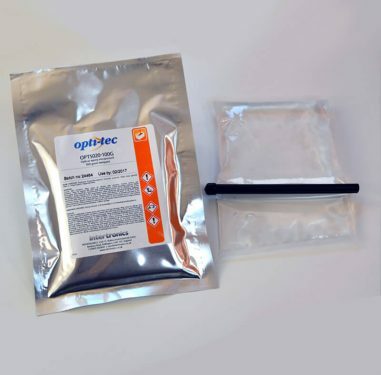 Opti-tec™ 7020 Optically Clear Silicone Rubber Potting Compound is a two part, clear liquid silicone elastomer which will cure at room temperature or can be accelerated at elevated temperatures. It has a low viscosity, which allows for ease of flow around complex parts, providing electrical insulation and shock resistance. Its combination of transparency, non-yellowing and compliance makes it suitable for encapsulation of sensitive electronic or opto-electronic parts (e.g. LEDs), protecting the components from vibration, moisture and atmospheric contaminants. 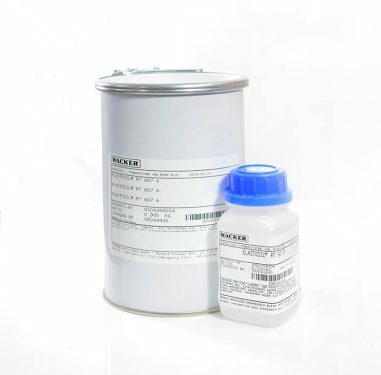 Has a chemical composition which provides hydrolytic stability and reversion resistance. It is an addition cure silicone with a platinum catalyst. 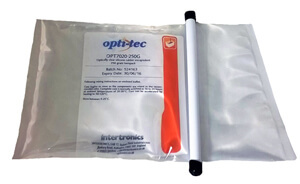 Opti-tec 7020 is available in twinpacks or in bulk. For bulk, weigh 10 parts of Part A to 1 part of Part B. Allowable tolerance on the measured weight for either Part A or Part B is +/-2.5%. The mixing container should be 4 to 5 times larger than the volume of silicone. Use stainless steel, HDPE, polypropylene, etc. Using clean tools, thoroughly mix the A and B components. Care should be taken to avoid excessive aeration. For many applications, natural degassing will be sufficient. If degassing is required, intermittently evacuate at 20-40 mbar for 15-30 minutes. Leave for a few minutes after releasing the vacuum to allow surface bubbles to collapse. Cure begins as soon as the components are mixed in the recommended ratio. Complete cure is normally achieved in 16 to 24 hours at ambient temperatures of 20-30°C. Cure can be accelerated by heating to 50-120°C. 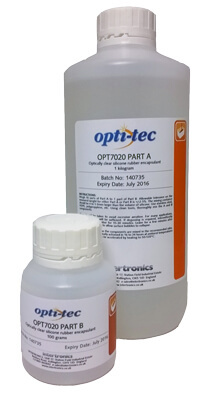 Opti-tec 7020 is supplied in matched kits in a 10 to 1 ratio of Part A to Part B – standard size is 1.1kg total. Unopened containers have a shelf life of 12 months at ambient temperatures. Alternatively, Opti-tec 7020 is supplied in pre-weighed 250 gram twinpacks.